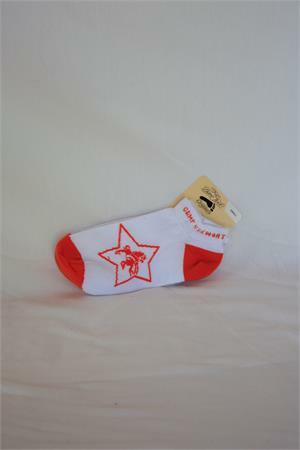 Made in the USA by ForBearFeet, Inc. these socks are white with the Stewart Star Logo and Camp Stewart in orange. Orange toe and heel design. Yarn has anti-bacterial properties to help inhibit bacteria growth. Wicking fibers channel moisture away from foot. Stretch nylon fibers throughout for additional arch support. Reciprocated heel and toe to prevent slippage.